Neoregelia 'Mother'(?) x Ananas nanus(? ), John Catlan. 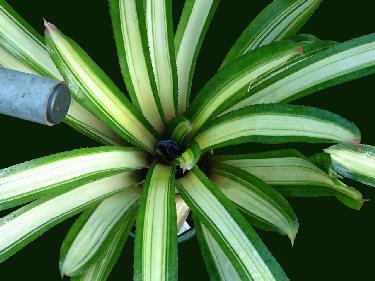 From "Uncle Derek Says"..."One of these plants does not flower as such, but produces a bunch of smaller twisted leaves where the inflorescence should be. It produces offsets which look normal until "flowering" time comes and you are rewarded with a bunch of leaves! This plant has been called 'Madam Lash'."